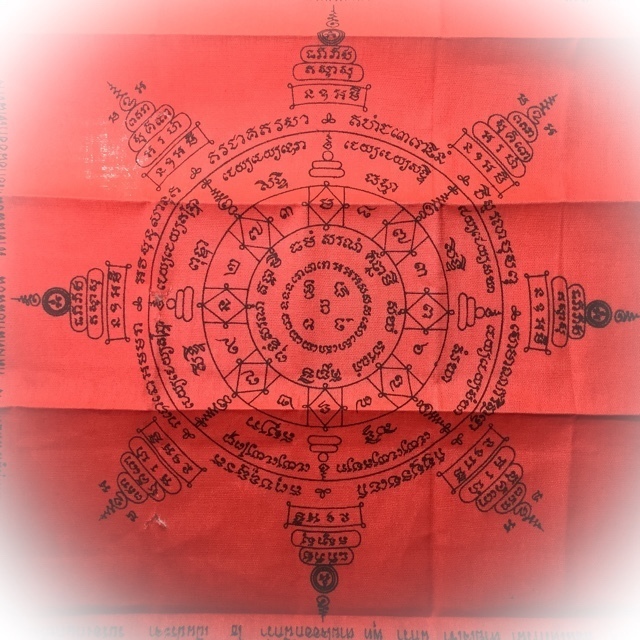 Pha Yant Pra Tammarach Gan Pai (Dharma King Protector of Dangers) - Sacred Yantra Cloth for Protection from the great Lay Master Ajarn Chum Chai Kiree, of the Dtamnak Kunjae Saiyasaret Dtak Sila Khao Or Lineage. Released in the year 2523 BE, this Pha Yant is an extremely rare item to find in the present day. The red colour used for the Pha Yant, which was made both as Suea Yant vests, and these square shaped Handerchief size Yant for portability, represents the blood of the brave warriors who gave their lifeblood to protect the nation. Ajarn Chum Chai Kiree made the Yant to give to his devotees, and donate to the military forces and pllice force, to protect them in the line of work and duty. Both versions of the Yant cloth were formulated and empowered using the Wicha Dtamrap Pra Tammarach, using the Yant Duang Pra Tammarach Yantra, combined with the Yant Pra Ruesi Plaeng Sarn, The Duang Yant Paniang Dtaek, and the Duang Yant Maha Ud. This Sacred Geometry formula forbids explosives, and prevents weaponry from causing harm, stops enemies in their tracks, evades danger, and brings victory in one's undertakings and ordeals. The Pha Yant can be worn in the pocket like a handkerchief (upper pocket),or placed above the door of house to prevent robbers, or in your shrine. If you carry it with you in the day, it can be placed at the head of the bed when you sleep, to protect you overnight. The Pha Yant were empowered by the Adept Masters of the Dtamnak Kunjae Saiyasart Dtak Sila Khao Or , who as usual for their empowerments of this kind, travelled to perform ceremony in the Tham Faed cave in Kanjanaburi (Wat Tham Faed). The ceremony was held on Saturday 26th and Sunday the 27th April of the Year 2523 BE. Ajarn Chum Chai Kiree was the Greatest Laymaster Sorceror of the last Century, and the head Brahman Master of Rituals for the Ordained Khao Or Masters of Wat Ban Suan and related temples. His inimitable ability to invoke both Maha Jang-Ngang Metta Mahaniyom Mercy Charm Magick, and Kong Grapan Chadtri, Klaew Klaad Protective Magick, is World Famous and Universally Accepted and Acclaimed since many decades. Ajarn Chum Chai Kiree was a Sorceror of truly supernatural ability, who was already immersed in the world of Occultism at the age of 5, and was even then able to use a mere two word Incantation to hypnotize any kind of poisonous snake into submission. Ajarn Chum was arguably the most powerful and famous Laymaster of all Thai Occult History, and his amazing miraculous feats of magickal Prowess are still the talk of every Samnak Saiyasart around the country, many years after his passing. His public shows of Miraculous Magick, has amazed a whole generation of faithful devotees. They are filled with faith in his inexplicable shows of power, and the miraculous events which many people who rever his amulets have encountered, has served to raise Ajarn Chum Chai Kiree to the Status of Grand Master of the Khao or Academy of Occult Sorcery. When Ajarn Chum was just 7 years old, he once grabbed the rifle barrel point of his father's friends gun who had come to visit, and chanted a mere 11 syllable Kata. The gun exploded and broke in half the next time it was used to shoot with. These events caused the villagers to believe in his powers, and have faith in his Magick. When he reached the age of Ordination, he ordained under Pra Ajarn Kong and stayed at Wat Chai Mongkol, until his disrobing. After this, he studied hard further as a Lay Practitioner and studied the Buddha-Dhamma. These events caused the villagers to believe in his powers, and have faith in his Magick. When he reached the age of Ordination, he ordained under Pra Ajarn Kong and stayed at Wat Chai Mongkol, until his disrobing. After this, he studied hard further as a Lay Practitioner and studied the Buddha-Dhamma. Later, he moved to Pattalung, and became a practitioner at the Dtamnak Dtak Sila Khao or, under Ajarn Iad (Wat Don Sala), as his Mentor in Magickal Sorcery. He already had fifteen years of ordained study and practice behind him befriended with the Great Luang Por Kong, and now became the Legendary Master of Khao or Sorcery. He was famous for many Miraculous feats from his amulets, including his famous Noo Kin Nom Maew Metta Oil, which he made, and tested with a show of putting baby mice and a cat who was giving milk into the same cage, after smearing some oil on them all. The mice ran to the teats of the cat, and the cat gave milk to the mice. Ajarn Chum had a very strange ability to decipher difficult methods of Sorcery and had a special mind that was attuned to mysterious forces. Ajarn Chum always used his famous magical 'Nam Man Solos Mongkol'' oil, to smear on the heads of the Devotees before performing Kong Grapan Magic. Ajarn Chum had a very strange ability to decipher difficult methods of Sorcery and had a special mind that was attuned to mysterious forces. Ajarn Chum always used his famous magical 'Nam Man Solos Mongkol'' oil, to smear on the heads of the Devotees before performing Kong Grapan Magic. "Na Mo Tassa Pakawadto Arahadto Sammaa Samputtassa, Na Mo Tassa Pakawadto Arahadto Sammaa Samputtassa, Na Mo Tassa Pakawadto Arahadto Sammaa Samputtassa"